The COUNTA function in Google sheets is one of the simplest and most used functions. It is very similar to COUNT in syntax and use. The Google Sheets COUNTA function counts the total number of values within a range. In this tutorial, you will learn how to use the COUNTA function in Google Sheets. This value is required. It is the value or cell reference of the range you want to count. This value is optional. Additional values or range references to count. Although COUNTA can take a maximum of 30 arguments, Google Sheets allows an arbitrary number of arguments for COUNTA. COUNTA Google Sheets function can be used to count numbers, dates, formulas, logical expressions, text, errors (e.g., #NUM), etc. Google Sheets COUNTA function can count cells containing a leading apostrophe (‘) without any other data in them. Google considers text following the apostrophe (‘) as texts. Google Spreadsheets COUNTA can also count cells containing empty strings (“ “) which look empty. 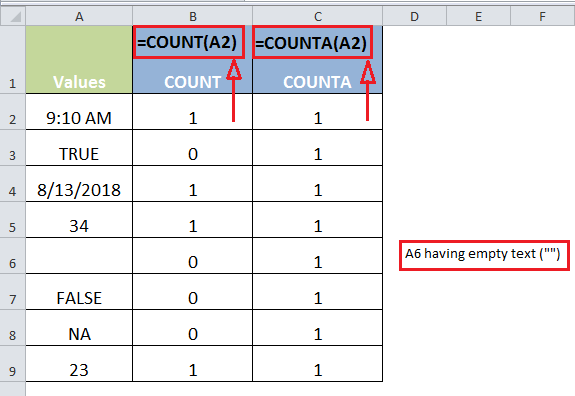 COUNT and COUNTA are the same functions with one major difference: the ability of COUNTA to count text values in spreadsheets which COUNT cannot do. However, none of them can count blank cells. When you modify the content in the range used as the arguments of a COUNTA function, Google Sheets recalculates the result. 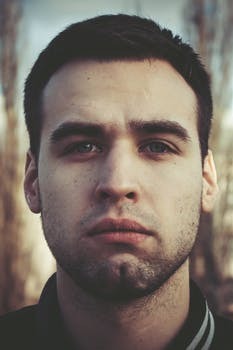 If a value in a range used as an argument for the Google Sheets COUNTA function, the repeated value will be calculated each time despite being repeated. The following examples contain sales data for different drinks for the month of August. It includes the name of the drinks, month and sales. The formula above explicitly counts the values 5600, 7720, 6070,3540, 8000 and “Not Available”. It counts the value “Not Available” twice though it is a repeated value. The main difference between COUNT and COUNTA can be seen from this example. The same arguments provided to the COUNT function would return the value 5, whereas COUNTA counts the text values as well and returns 7. Here COUNTA counts the numbers 5600, 7720, 6070,3540, 8000 and returns the number 7. Counts both the numeric and text values between C2 to C8. Returns the number 7 which is the count between the values in cell C2 to C8. Cell E5 counts the date values in the range B2 to B8. The B column is formatted as dates and COUNTA calculates and returns the total which is 7. 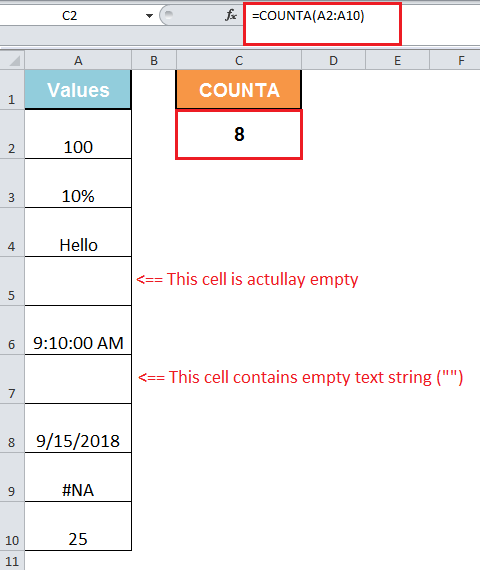 This formula counts the values from cells A2 to A8. Cells A2 to A8 have text values which can only be counted using the COUNTA Google Sheets function. This formula returns the number 7. COUNTA Google Sheets recognizes text, number, date, and other values but fails to calculate blank cells. In the following example, you will see some cases of how Google Sheets COUNTA function deals with cells containing empty or blank cells. The following example has some empty strings (“ “), double quote (“), apostrophe (‘) and blank values in cells A2 to A9. Column B has the corresponding values in column A described in words. Column C contains the formulas used, and column D has the results. 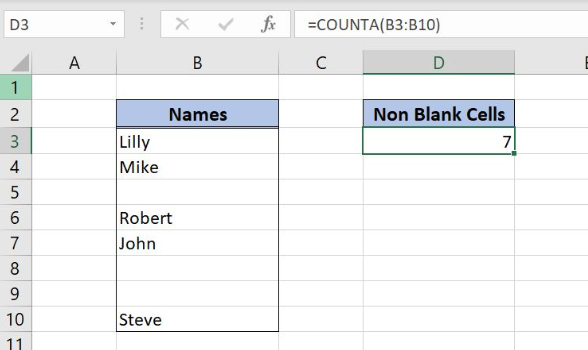 This formula counts the empty strings (“ “), double quote (“ “) and apostrophe (‘) values between cells A2 to A9. However, it ignores the blank cells A4 and A7. It returns the result 6 in cell D2. COUNTA Google Sheets function is one of the most popular functions to count values. Though COUNTA is almost identical to COUNT, the ability to calculate text values has made it more popular than its counterpart. It still has some limitations, like the inability to count blank cells. Apart from that, Google Sheets COUNTA function is an excellent choice for counting values in a range. Possible to pull in values from Google Adwords into Google sheets, using date range from Google sheets?